View of a ruined building located on the coast at St Helen’s in the Isle of Wight. St Helen’s lies to the north of Bembridge on the eastern coast of the Island. 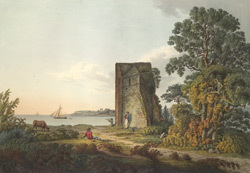 It is thought that the ruins in the print are the remains of a 12th or 13th century church or priory which was built on land overlooking the harbour below. The building was eventually abandoned when it became unsafe through erosion and damage from the sea. St Helen’s was a substantial port in the 14th century but declined in importance as ports in Cowes and Yarmouth grew.